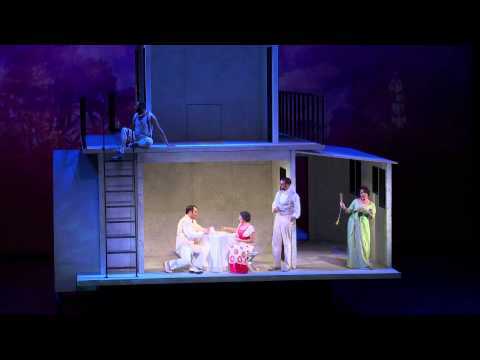 Florencia in the Amazon is a contemporary Spanish opera in two acts by Daniel Catan. Inspired by though not directly the magical realism work Love in the Time of Cholera of Colombian Nobel Prize winning novelist Gabriel García Márquez. The libretto of Marcela Fuentes-Berain, tells the story of the famous operatic diva Florencia Grimaldi (Melody Moore) heading down the Amazon to sing once again the opera house of Manaos, with the hope that her performance will attract her lover Cristóbal, a butterfly hunter who has disappeared into the jungle. She boards the steamship for the trip down the Amazon River, along with several passengers who are traveling to hear her sing. However, the passengers are unaware of her identity. One of the passengers is Rosalba (Andrea Carroll), is a journalist planning to write a book about Grimaldi and hoping to interview her. Initially, Florencia does not interact much with other passengers. The threads of the subplots are provided by the ship’s mate/river god, Ríolobo (Norman Garrett). Ríolobo functions as a narrator, one of the character, and the intermediary between reality and the mystical world of the river. When the boat finally arrives in Manaus, a cholera outbreak keeps the passengers quarantined aboard the ship. Florencia despairs of a reunion with Cristóbal, but in the end she is magically transformed into a butterfly, which represents her spirit going off to reunite with her lover. The music is lush and evocative of Puccini in a lot of places but the fact the all of the action is being stuck on a boat all the time challenges the audience were it not for the video projections creating a dreamy fantasy landscape. Melody Moore gives a strong performance of the aging opera star, but it was the soprano voice of Andrea Carroll is impressive and brings brightness to the stage with its infectious lyricism. As her love interest Arcadio (Patrick O’Halloran) brought passion and feeling to the role. As usual, I have included a clip for your enjoyment.